Whether you call it sakura (Japanese), yīng huā (Chinese), or cherry, these members of the Rosaceae family grace the Missouri Botanical Garden with their majestic yet delicate beauty each March and April. The Garden displays over 230 individuals in the genus Prunus, which contains not only ornamental flowering cherries, but also fruit trees such as cherries, peaches, nectarines, almonds, plums, and apricots. The earliest bloomer in our collection is the Japanese apricot that appears as early as the end of February and exhibits spicily fragrant, simple white flowers. Look for a related cultivar, 'Peggy Clarke,' that yields rose pink petals. The Chinese Garden also contains the Chinese plum, noted for its double pink flowers. Flowering trees are hard to miss while walking the 14 acres of the Japanese Garden during the peak spring blooming season. 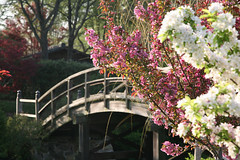 On display are cherry trees, plums and over a dozen 'Kanzan,' noted for frilly pink blossoms throughout April. Perhaps the most dramatic flowering cherry in our collection is the weeping Higan cherry, which produces sweeping branches covered with rosy flowers. There are over 40 weeping Higan cherry trees throughout the Garden, with dozens in the Japanese Garden alone. There are also over 40 specimens of Yoshino cherry throughout the Japanese Garden and you can enjoy their fragrant white blossoms throughout April. During your visit, look for wild black cherry, which is native to North America and produces diminutive, fragrant, white flowers that hang in a cluster. Twenty Centennial cherry trees were planted in 2012 to commemorate the 100th year anniversary of the gift of cherry trees from Japan to the United States. These 20 trees are cuttings from the original trees gifted in 1912 by the mayor of Japan. The Sargent Cherry blooms after leafing out in April, and its pink blossoms can be seen in both the Boxwood and Japanese Gardens. 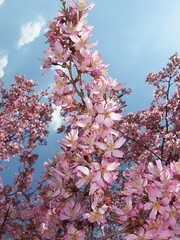 The Kemper Center for Home Gardening displays several other Prunus species of note, including some that bear fruit. Prunus persica var. nectarina 'Mericrest' is a dwarf tree that produces not only lovely blooms in April but also standard-sized nectarine fruit. Prunus persica 'Bonfire' is an ornamental peach that yields branches covered in blooms from late April through May. This variety is located in the Kemper Center Family Vegetable Garden. In the George Washington Carver Garden, the Mount Fuji cherry 'Shirotae' produces white blossoms that are both light pink and fragrant in late March to early April. Walking the Missouri Botanical Garden between the last two weeks of March through the first week of April will surely wipe away those memories of our most recent winter.